With the sun shining, hands were managing cold beverages and sunscreen as the tunes kicked off for the day. 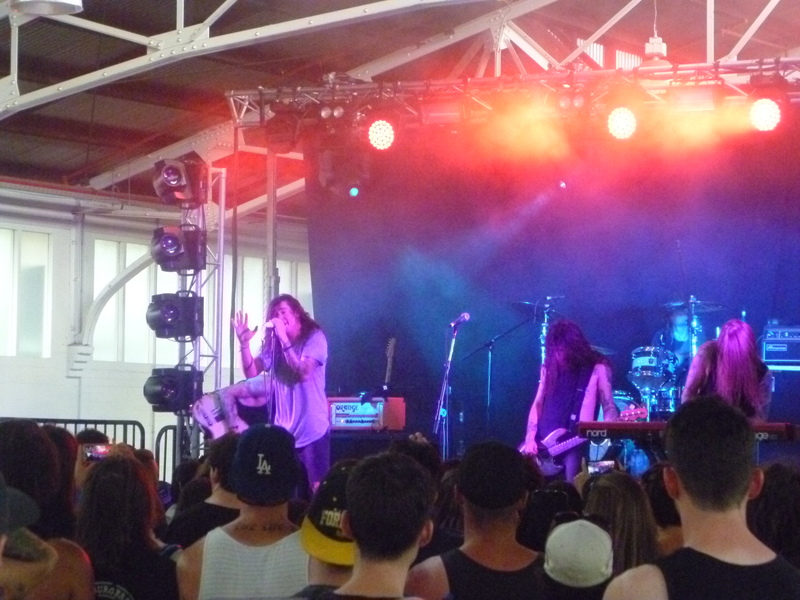 With no time to waste, the day’s proceedings kicked off with Dayshell. No strangers to the sun, the three piece from Southern California brought a taste of tunes from their self-titled album. Not Coming In, the album’s opening track was a fine intro to the hard-edged rock and soaring vocals that followed, not to mention the bass laden Avatar and Useless bringing a change of pace but no less intense. A quick listen to Apocalyptica pre-festival made them a must see, but what these guys manage to do with three cellos, drums and vocals on stage is pretty spectacular. It’s the sort of thing that might cause a few string teachers and orchestral conductors to have a nervous breakdown, but anything that attempts to do things a little differently has to be commended. A quick stop by at another stage meant time check out Conditions, rock delivered with roaring melodies and boundless energy. The band was certainly keen to get the crowd involved with When it won’t save you, to which the crowd obliged and ending on a high with Better Life. 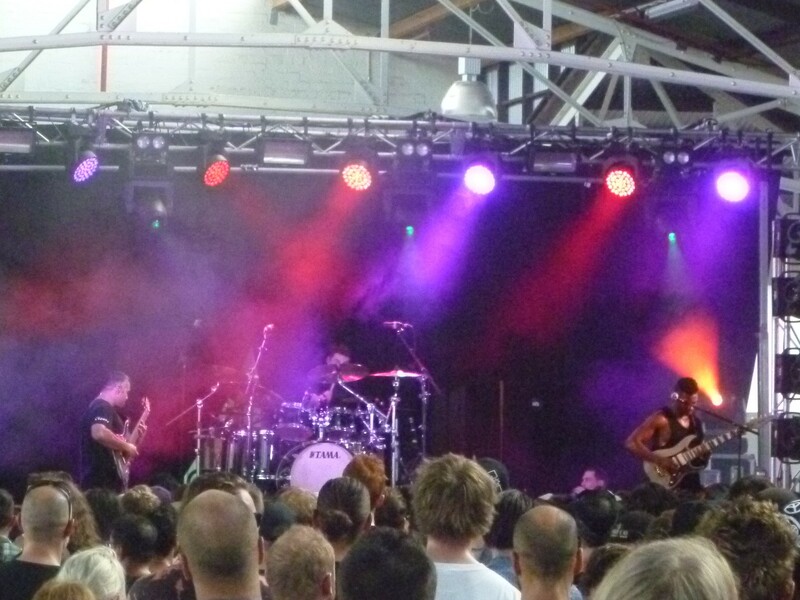 From energy to passion and intensity of the experimental / progressive creations of Animals as Leaders, to a crowd that was superbly attentive by festival standards, melting away in the heat or perhaps a combination of both…but definitely one to keep listening to. Ever persistent heat, looming clouds but there was no time to waste, moving straight to something a little more local from Sydneysiders Tonight Alive and the powerhouse that is Jenna McDougall on vocals. And if their own tunes weren’t enough to please, the talented bunch threw in a little Rage Against the Machine medley…can’t beat a little Killing in the Name. 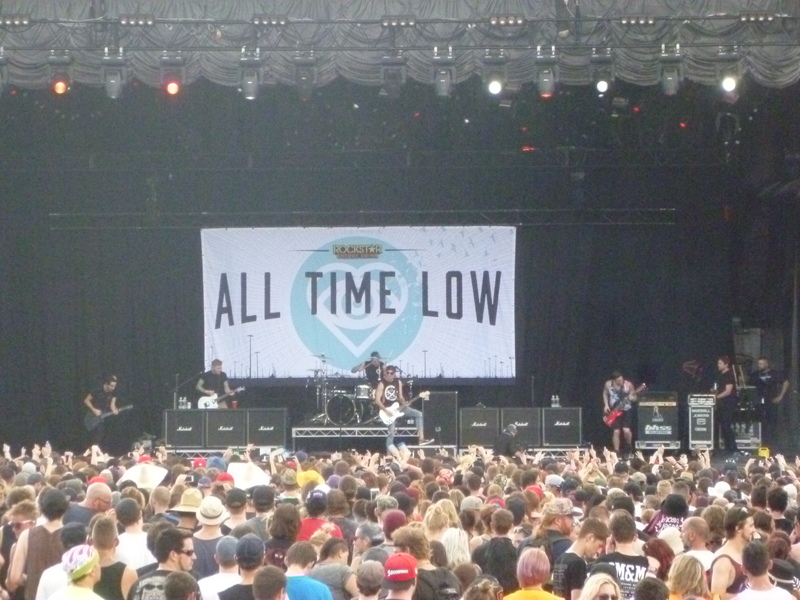 Moving from stage 2 to stage 1 required a mere head turn to the left to see All Time Low. 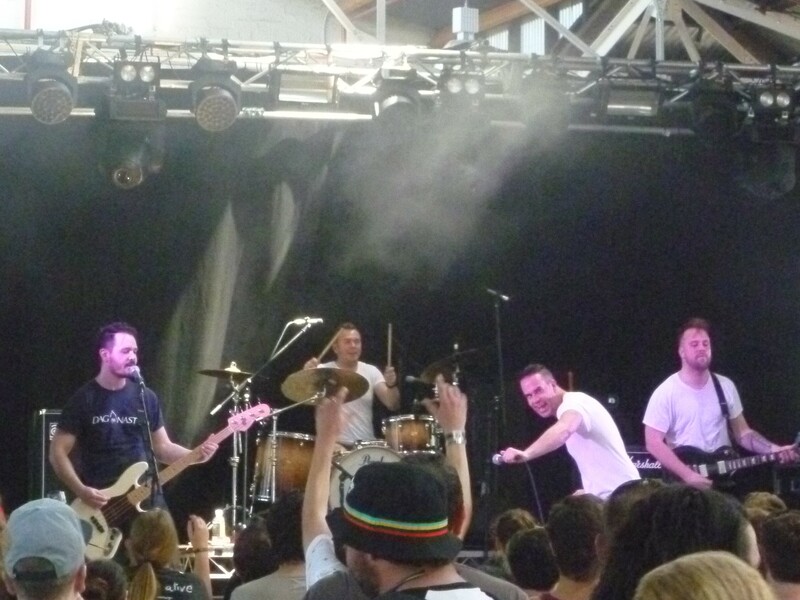 An impressively energetic live set, and while some of the between song banter probably could have been left out. 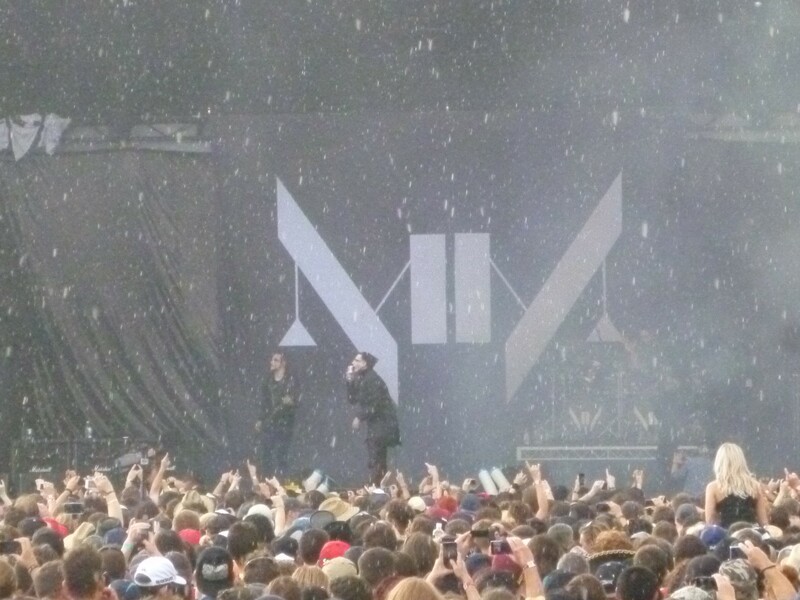 A little rain did little to dampen the mood and some noteworthy kudos was due for getting a bunch of fans up on stage to help out with Time Bomb. 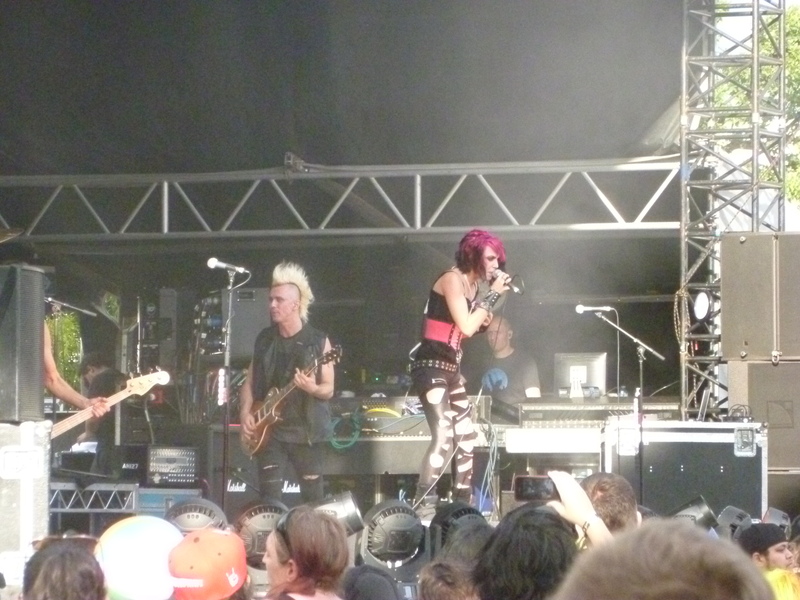 The weather remained at bay for Papa Roach, a bit of a blast from the past but with new material to share. There didn’t seem to be any evidence of a band hiatus based on live delivery, with nonstop sounds and energy. 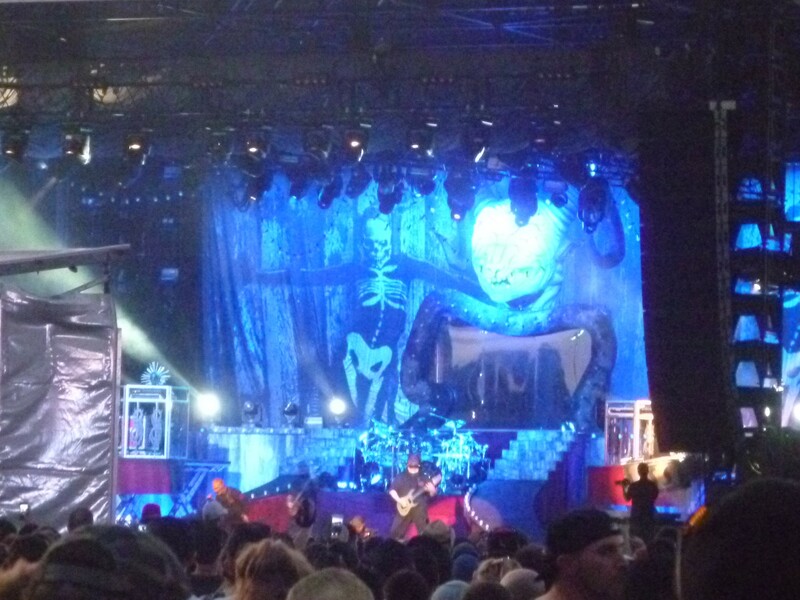 But the people arrived in droves awaiting Marilyn Manson, even garnering cheers from the people in the stands. 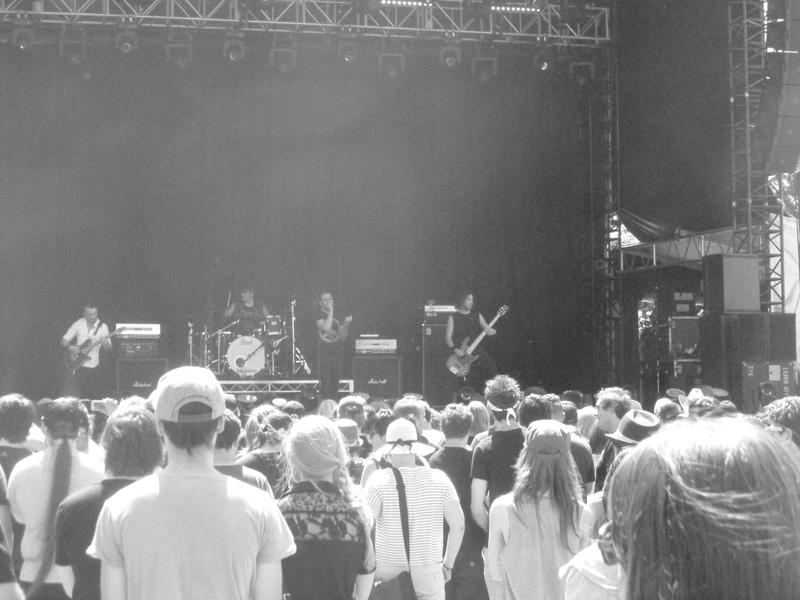 Sounds from the band, and a wail from the pale emperor himself to announce the arrival on stage with Deep Six. Encapsulating the alternative, the intense and the dark, not to mention a cover of the Eurythmics’ Sweet Dreams (Are Made of This) and a formidable inclusion of The Beautiful People. 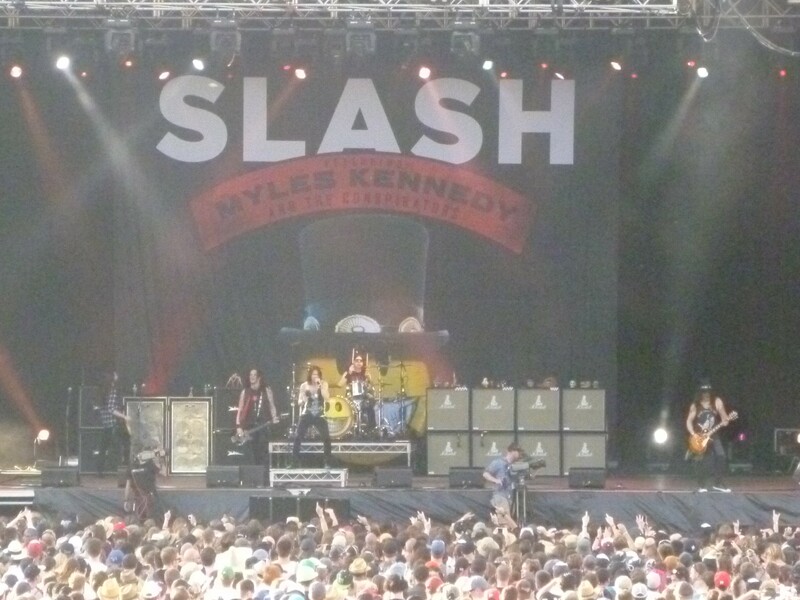 From the dark to the shredding of Slash, together with Myles Kennedy and the Conspirators on stage. Kennedy dominated the vocals, but Todd Kearns had a pretty impressive crack at the lead gig for a few tunes as well. No matter what was happening on stage though, Slash was definitely stealing the show with guitar goodness. A few Guns N’ Roses numbers made the cut, but none more anticipated that Sweet Child o Mine. Based solely on the number of t-shirts being worn and the extra dedication of band masks and get up from others, there was some serious anticipation around for Slipknot. Without claiming any admiration or enthusiasm myself, this was still a must see and even for the short viewing time it was clear to see how the life force of the band on stage could attract a cavalcade of fans. 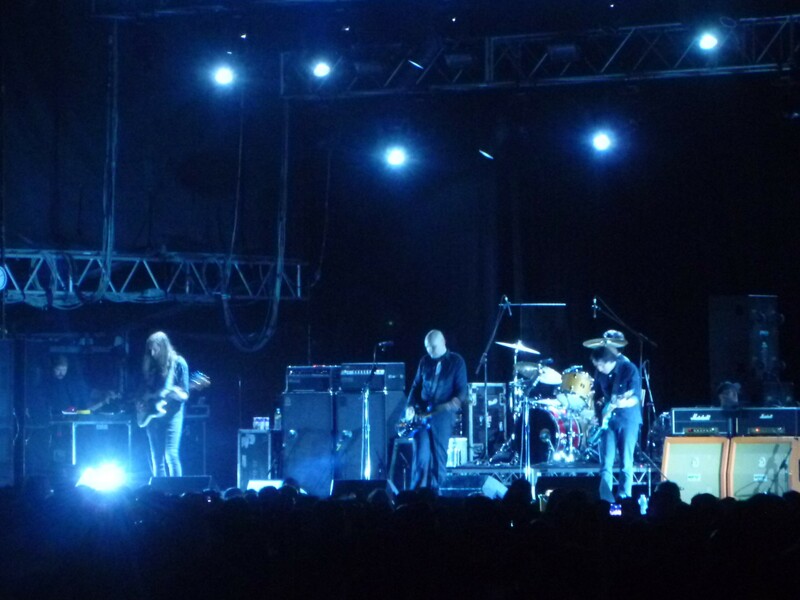 But attention wavered with a trek to on the other side of the festival grounds to watch The Smashing Pumpkins. As much as this was a must see, and a must hear with the distinctive vocals blasting through there was also a degree of skepticism. Sure, the material was courtesy of the Smashing Pumpkins, but the band on stage was Billy Corgan sans the original line up, not even the initially revised line up of years gone by. 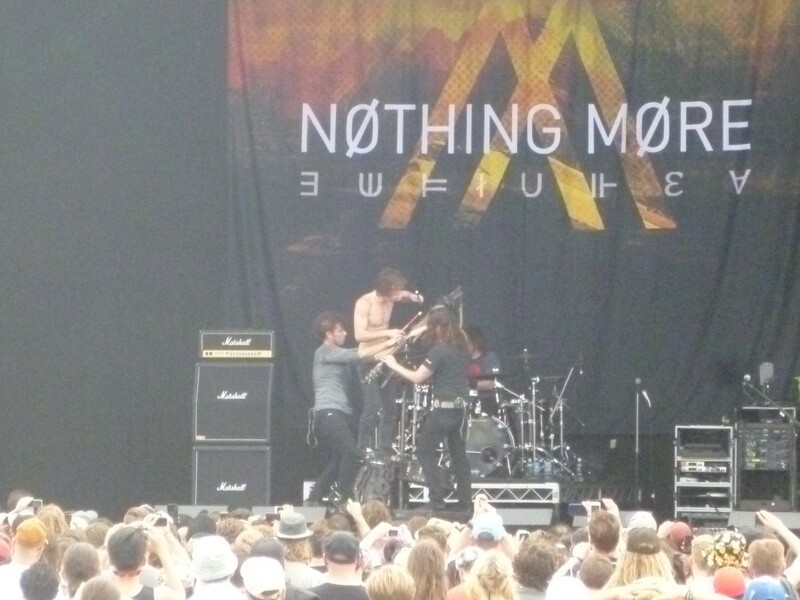 But when you’ve got Brad Wilk on drums, there’s not a whole heap to complain about. Plus, it sounded pretty damn good despite being a fair way from the stage, unsurprisingly with the older tunes garnering the biggest cheers and singalongs. Coffee, energy drinks and sunshine accompanied the return for day 2, but despite being pretty keen to check out Raglans to kick off the tunes, a tight schedule and delayed start meant the wisest decision was to head back to the main stages to watch Area 7. Arriving to the sounds of sirens, these local legends had fans young and old rocking out before too long in impressive displays of energy and tributes to second class citizens, bogans and a nod to The Angels with a cover of Am I Ever Gonna See Your Face Again. Despite the early hours, maybe ska is the way to kick off a Sunday after all. Yes, it was hot…again…but the dismal shade within the vicinity of stage 4 was no barrier to checking out Nothing More and just as well with a killer live performance. Tight sounds, and as much about the fanfare as it was about the music, challenging conventions about how many band members could play a single instrument simultaneously – killer stuff. 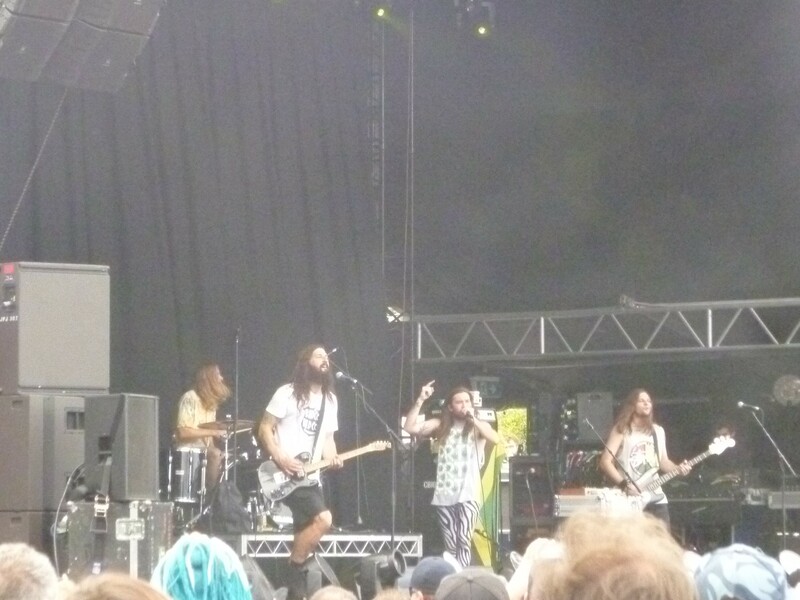 You can always count on The Bennies for bringing the goods on stage, guaranteed to have smiles on faces and feet dancing along in no time and this was no exception. And there must have been something in the air, given that there was another nod to the Angels during Knights Forever, almost a little déjà vu from only a few hours earlier. 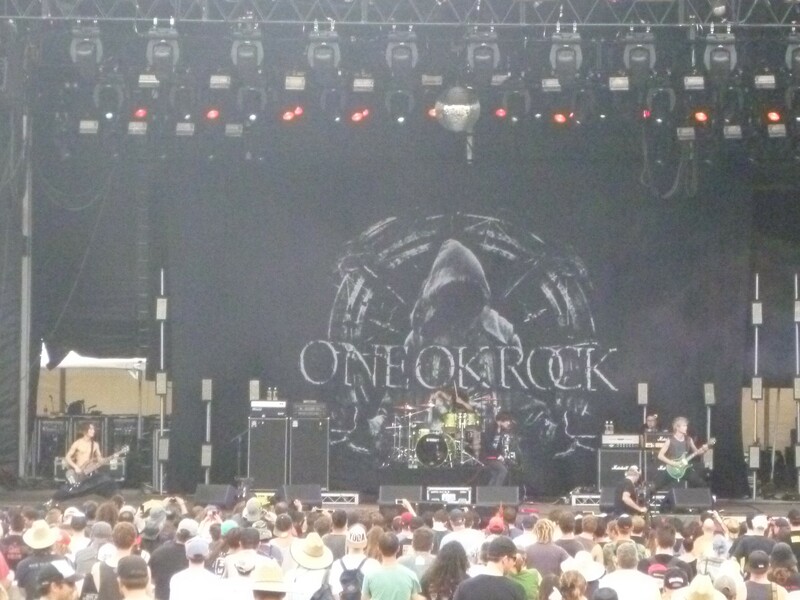 One Ok Rock made their way all the way from Japan to our sunny shores…and without even having a quick listen beforehand it was a damn good decision to stop by stage one, with the intensity of their live presence evident even without being anywhere near clear sight of the stage. 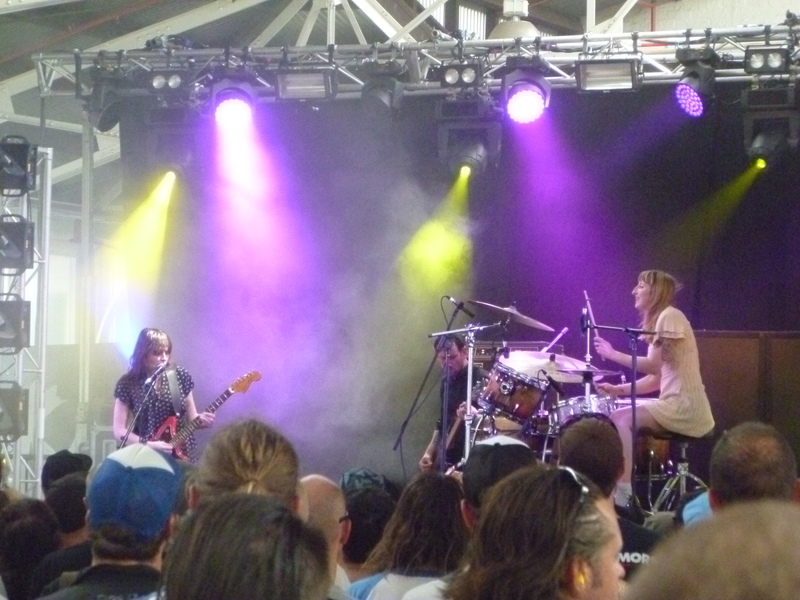 But then moving on to see Le Butcherettes…just in time to see three members on stage become two, followed by perplexed comments of, “Where is she” and “Where’d she go?” – She being lead singer, wandering out of the shed containing the stage out into punters sprawled along the shaded asphalt seeking relief from the blistering heat – at least no one missed out. A glimpse of pink and bleach blonde hair from Gerard Way on the way to check out Steel Panther. Not the usual fit within my viewing plans, but may as well take advantage of at a festival. It didn’t last long, impressive as those glam rock outfits are, the whole NSFW content was just a little too much to bear and passed the line of humour. 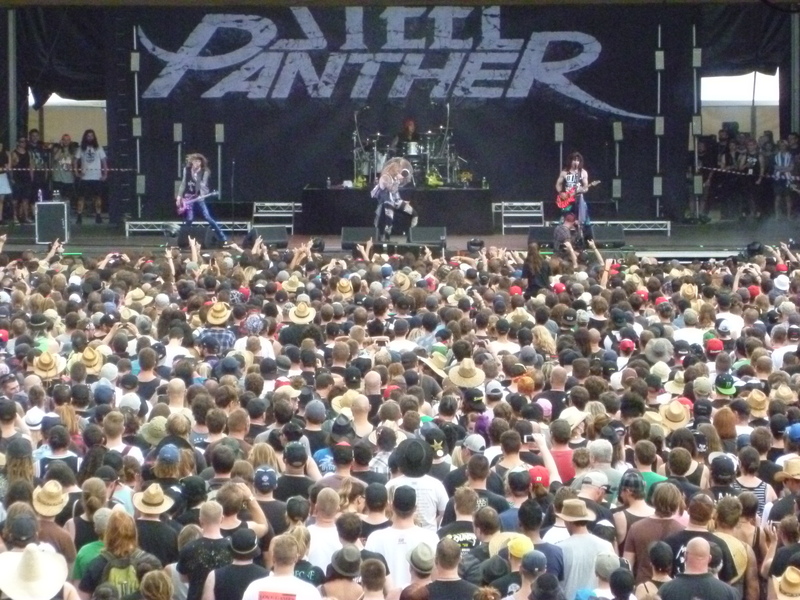 Perhaps it’s getting old or just prudish, but there was time to be better spent on checking out other bands. So wandering away meant checking out Sleepwave…with sounds turned up loud enough to hear on approach. Vocals streamed through with fervour and zeal, with everyone else on stage doing a fine job of delivering in equal measures. Fear Factory certainly wasn’t for the faint-hearted but passing up the chance to see them on a festival line up would have been a mistake despite the crowds. There was no point wasting precious time or steps on the way to the next act on the list, taking advantage of a very brief stop to check out Icons for Hire. Not planned by any means, but a worthwhile stop nonetheless. Managing to mix in some hip hop with their alt pop-rock delivery, and no shortage of performance skill to entertain those present. Incubus was on the list, but only from afar on this occasion given the priority given to seeing the following act on the neighbouring stage but with all the sounds for a nostalgic trip back in time. 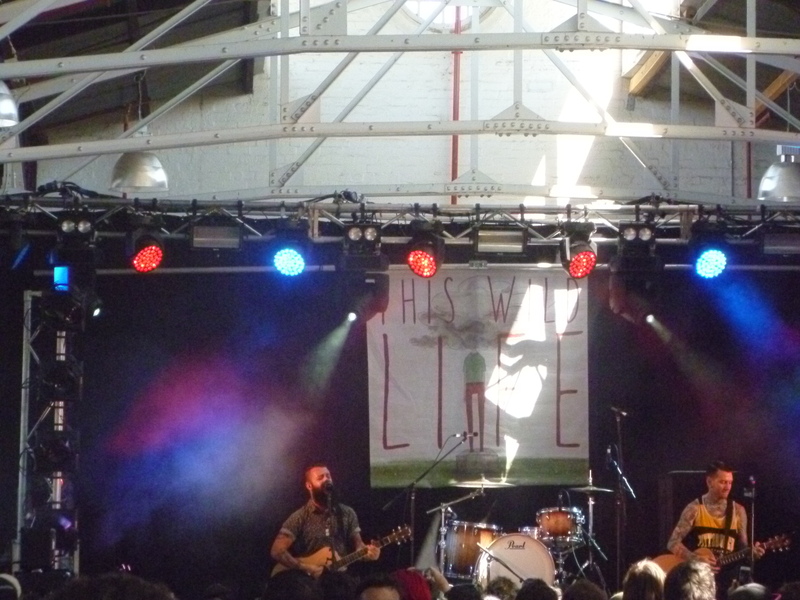 The solitude of In the Company of Wolves may have been lost on a festival crowd but only momentarily as the set continued to alternate between mellower and the band’s distinctive rock delivery, saving the infamous Meglomaniac and A Crow Left of the Murder for last. 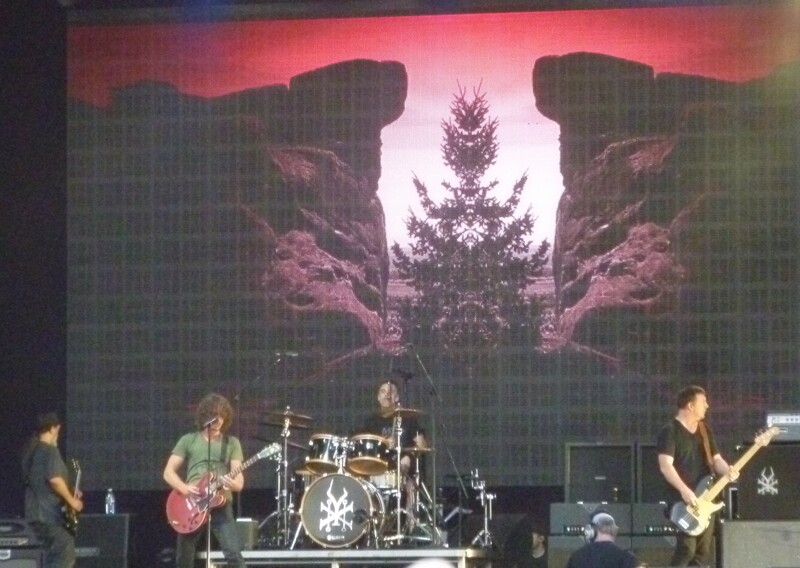 Soundgarden, the act at the top of the priority list for festival viewing were as solid as expected and there were certainly no disappointments. A barrage of cheers that didn’t stop until the first sound of those distinctive vocals from Chris Cornell, raising cheers and applause with soaring notes and screams. Spoonman came and went all too quickly but luckily there was so much more ahead. Outshined impressed, before the soaring Rusty Cage and the ongoing deluge of sound, every note sounding as perfect as ever. 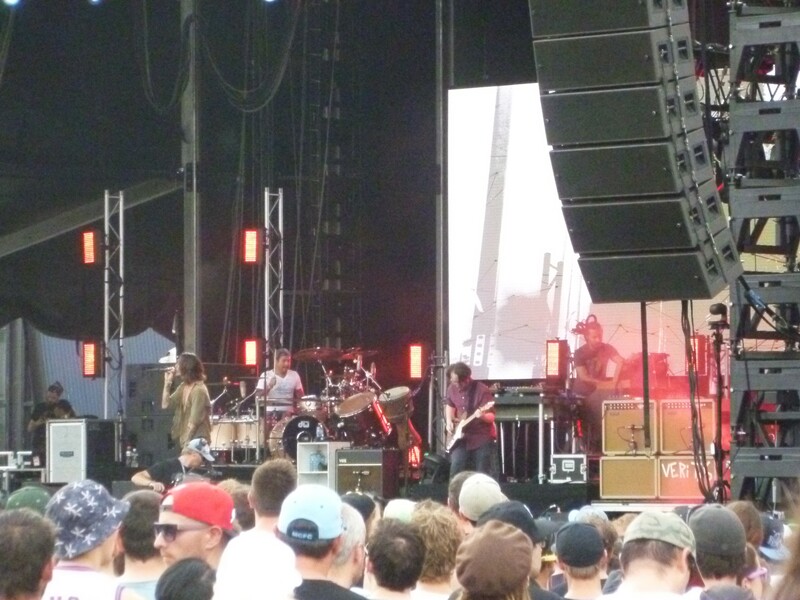 Inevitably Black Hole Sun made an appearance, and the crowd’s reaction was enough to suggest that Fell on Black Days was eagerly anticipated, but the highlight came from the surprise inclusion of Birth Ritual – and of course mandated a viewing of Singles the next day as part of festival recovery, all before seeing Soundgarden again a few days later. Faith No More, with their medically inspired attire kicked off a welcomed return to our fair shores with a newbie, but it wasn’t too long before some more familiar sounds pounded through. 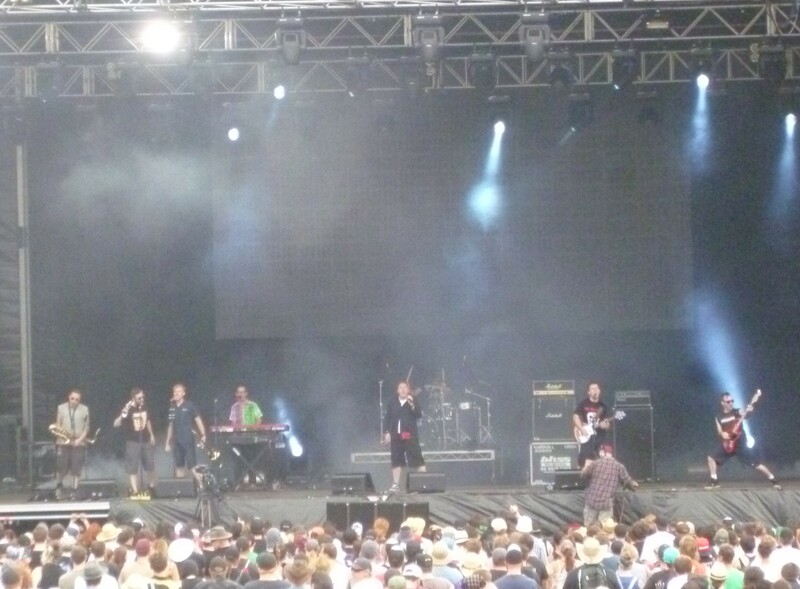 Later comments from the stage about getting older could have easily been dismissed given the ferocity of Caffeine, the sleek sounds of Evidence and the superbly iconic sounds of Epic. 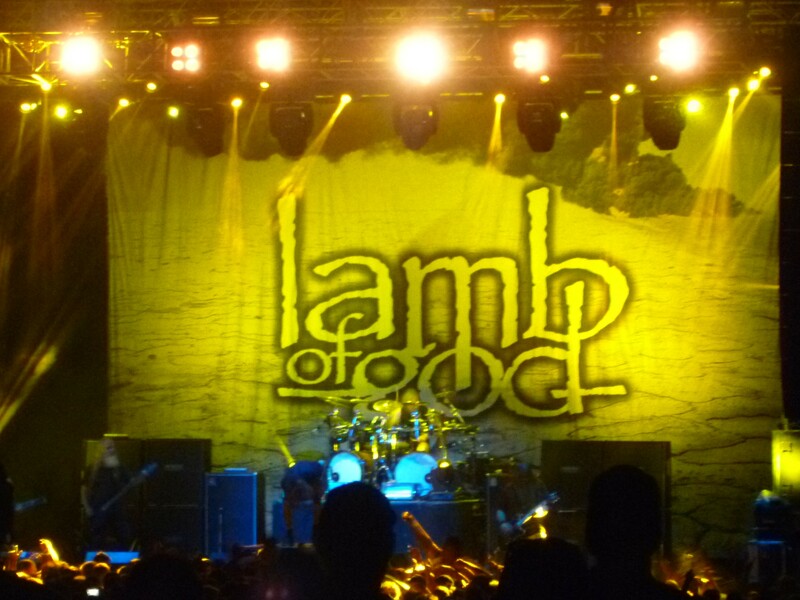 Apparel choices on day two indicated that Lamb of God was going to be drawing a pretty sizeable crowd, and that they did. A few friendly shout outs to other bands filled between song banter, and nailing an explosive and intense delivery of sounds as predicted, impressing with Hourglass and everything that followed. And then there was still time for just a little more Faith No More…only by sound given the lack of any view of the stage. For old songs and for new songs, the epic Ashes to Ashes and bringing more intensity to Superhero on stage. And just when it all seemed to be over, there was an encore…not a bad soundtrack to end the day and commence that weary journey home.